The College of Education changed the way John Miller IV ’17 MED saw himself as a scholar-practitioner — and reminded him that he’s not in the field for himself but to help raise the next generation of global leaders. Why I Chose My Field of Study: I kind of fell into higher education. As an undergraduate psychology major at NC State, I was more focused on leadership experiences. Once I realized that I could make a career out of the passion that I have for working with minoritized college students and equity education, I knew that higher education was my calling. An Experience that Made a Big Impact: The opportunity to travel abroad for the first time to Beijing, China, through the Counselor Education program. Through this course abroad I was able to examine different student affairs offices at Chinese universities through cross-cultural lenses. I was also able to explore the challenges of international student preparation and student support services in the U.S. higher education system. 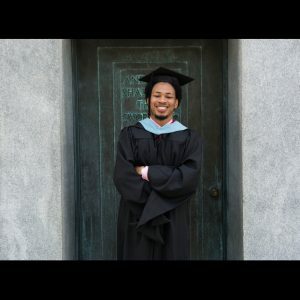 How the College of Education Changed Me: The college has changed the way I see myself as a scholar-practitioner. Some of my favorite memories include serving on orientation panels for incoming graduate students and the networking events hosted by the Graduate Student Success office. Both allowed me to make connections beyond my Higher Education Program folks, especially other people of color, and learn about some remarkable things my peers are doing. My Advice to Others Considering Education: My life motto is an African proverb: “I am because you are, you are therefore I am.” Working in education can be frustrating, irritating and a seemingly endless test of your patience. But remember that we don’t do it for us, and we surely don’t do it for the paycheck. We should do it to guide future generations of global leaders that will impact what happens to our future. We have an obligation to pour into them like someone poured into us. If your contribution is as an educator, pursue it. My belief is that everything else will work out.